Desk Report : This April 22, 2011 handout photo provided by National Geographic shows more than a dozen bodies preserved in dry sand for more than 500 years, at the Huanchaquito-Las Llamas site near Trujillo, Peru. Researchers reported that, “except for three adult burials (two females and one male), all the human skeletal remains were of children, ranging in age from approximately five to fourteen years, with the majority falling in the range of eight to twelve years of age. Archaeologists in northern Peru say they have found evidence of what could be the world’s largest single case of child sacrifice. 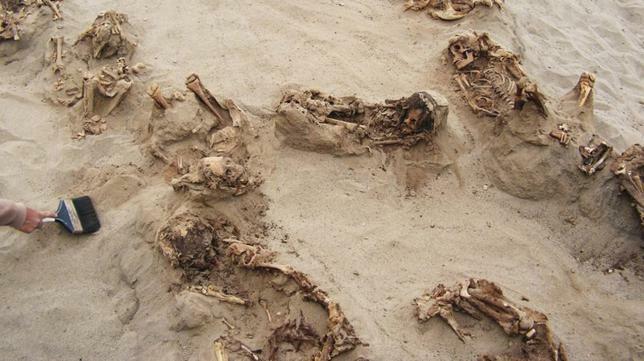 The pre-Columbian burial site, known as Las Llamas, contains the skeletons of 140 children who were between the ages of five and 14 when they were ritually sacrificed during a ceremony about 550 years ago, experts who led the excavation told The Associated Press on Friday. The site, located near the modern day city of Trujillo, also contained the remains of 200 young llamas apparently sacrificed on the same day. The burial site was apparently built by the ancient Chimu empire. It is thought the children were sacrificed as floods caused by the El Nino weather pattern ravaged the Peruvian coastline. “They were possibly offering the gods the most important thing they had as a society, and the most important thing is children because they represent the future,” said Gabriel Prieto, an archaeology professor at Peru’s National University of Trujillo, who has led the excavation, along with John Verano of Tulane University. “Llamas were also very important because these people had no other beasts of burden, they were a fundamental part of the economy,” Prieto said, adding that the children were buried facing the sea, while the llamas faced the Andes Mountains to the east. Excavation work at the burial site started in 2011, but news of the findings was first published on Thursday by National Geographic, which helped finance the investigation. Prieto said that besides the bones, researchers also found footprints that have survived rain and erosion. The small footprints indicate the children were marched to their deaths from Chan Chan, an ancient city a mile away from Las Llamas, he said. Verano said the children’s skeletons contained lesions on their breastbones, which were probably made by a ceremonial knife. Dislocated ribcages suggest that whoever was performing the sacrifices may have been trying to extract the children’s hearts. In an email, Quilter told the AP the site provides “concrete evidence” that large scale sacrifices of children occurred in ancient Peru. “Reports of very large sacrifices are known from other parts of the world, but it is difficult to know if the numbers are exaggerated or not,” Quilter wrote. Quilter is heading a team of scientists who will analyze DNA samples from the children’s remains to see if they were related and figure out which areas of the Chimu empire the sacrificed youth came from. Several ancient cultures in the Americas practiced human sacrifices including the Mayans, the Aztecs and the Incas, who conquered the Chimu empire in the late 15th century. But the mass sacrifice of children is something that has rarely been documented. The Las Llamas site is located in a shantytown, and has been fenced off to stop illegal developers from building homes on it. Prieto says the site shows how in Peru history can be just around the corner.